Cherishing Indic and Kindred Traditions… in and beyond the Subcontinent! Poetry, sans Pretensions, from the Indic Heart. It has been a long, VERY long time that I’ve written in this blog: procrastination, perhaps; but I wasn’t moved enough about anything that hadn’t been dealt with already by a zillion other bloggers! Now, I felt it’ld be nice to restart blogging with a small write-up about a recent book by a friend and fellow-son-of-the-Indic-soil; born in a rather remote part of Eastern India, Abhay Kumar worked his way up the socio-economic ladder, with degrees from the country’s “best” university, our common alma mater, and entry to the much-coveted Indian Foreign Service, which attracts the crème de la crème of India’s civil servants. We’d connected in Russia and kept in touch, though he’s back in Delhi and I’m in the heart of Europe, and I do hope I’ll’ve the privilege of being privy to his creative explorations in the future, too; if readers’re interested in knowing more about Abhay, please go to this URL: http://www.abhayk.com/p/about-me.html. I’ll go on to his latest anthology now. Abhay Kumar’s Candling the Light is, arguably, the most refreshing and noteworthy of his works till date, especially in its orientation around key human emotions and experiences, like love, loss, family ties, spontaneous kindness from a stranger et al. His is a poetic voice that speaks with a self-effacing and all-embracing gentleness and gentility, sans any pretensions; his quaint and disarming introduction to his poetry makes it clear that his goal is not to affect poetic tropes of high complexity but to speak the direct and accessible language of the heart. There are some passages, lines and turns-of-phrase, e. g., “[l]ies are incarnations of the truth”, “[w]on through smoke”, “The war against terror,/ Would not be over,/ Till we eradicate malarial fever” etc., that make one taste the inherent exquisite innocence of Kumar’s poetry; a personal favourite was the poem “A Non-Smoker’s Tale”, which does succeed in inverting the stereotypical relationship between smoking and artistic-cinematic depth. It is in the poems that deal with his relationship with his father and grandmother and lament their passing away that Kumar manages to evoke both a smile and tear, with sheer lyrical spontaneity and subjective/thematic honesty and candour; his poetry is most redolent of the earthy smell of his roots and, with charmingly-characteristicloyalty and straightforwardness, it reminds the reader of her/his need to reconnect with her/his own roots! Another personal favourite is the “The Old Lady from Far”, which shows the deep empathy the poet has with the sufferings of the deprived and the dispossessed; this poem brings the lonely suffering/s of the poverty-stricken babushka from the Moscow-Metro to the readers’ attention, sans rubbing the message in. 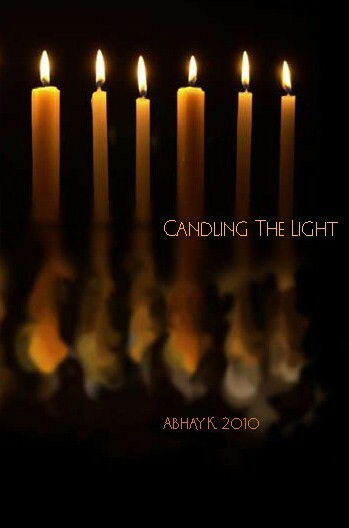 In a nutshell, Abhay Kumar’s Candling the Light is an exhilarating offering from a maturing poetic voice; encore! Ashwani Makkar on The Diaspora Roars! Mr WordPress on Theme-Statement for the 16/05/2005-Seminar, in SLL&CS, JNU.